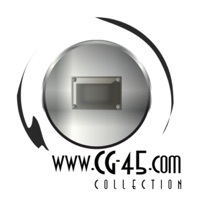 Thursday June 30 2011, 3 new helmets on the website. 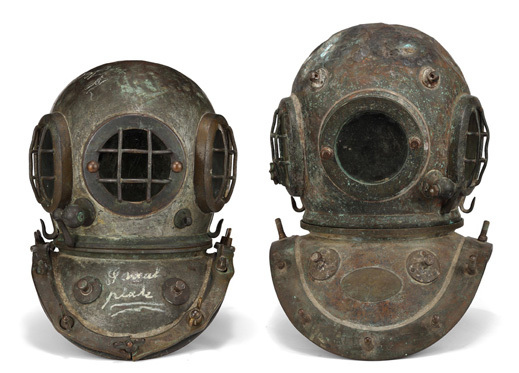 Since the early nineteen eighties diving equipment has been reproduced to be sold as genuine antiques. Read the amazing story about the rude dealers and be alert for the next generation of bad helmets on the market: last week the second fake Siebe Gorman ‘Utility’ or Heinke ‘Harbour’ helmet has showed up on the collectors market, apparently these are currently manufactured in a workshop near Gdynia in Poland. Only 3 weeks ago the new chapter ‘Fake Helmet Alert!’ has been added to this website after a new series of fake helmets had been discovered: the 3 bolt Siebe Gorman Heinke helmets. 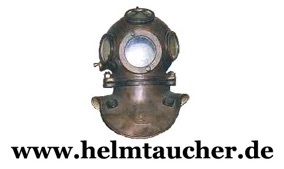 Last week I received a sad email from Denmark where a collector had bought such a helmet and a fake Draeger helmet. 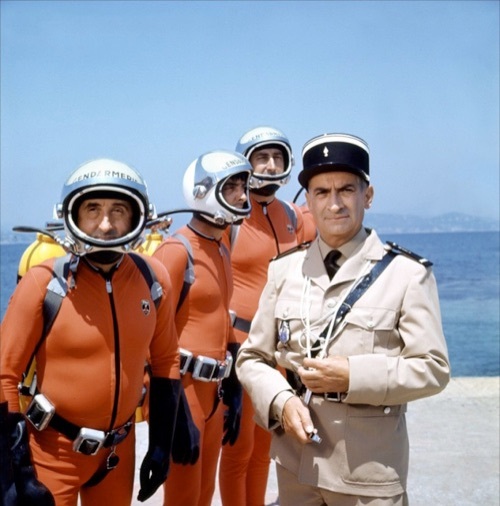 The helmets were sold to him as genuine diving helmets by a young man calling himself ‘Johnny from France’ who drove a white van with french license plates. The german dealer and his son who sold an identical fake helmet here in Holland have an address in France and drive a bleu Mercedes Benz E class sedan with french license plates. The danish collector provided the license plates number of the van ‘Johnny’ drove in and currently these license plate numbers are checked out with the french police. The young man calling himself Johnny is believed to be the son of the german dealer family, the van might be a rental. The license plates numbers are: 250 BVL 83 please let us know when you are contacted by or have met with these dealers. Today 6 new chapters have been added to the website, all explaining the projects we have been working on since 2004. 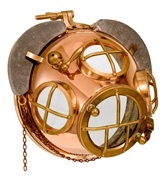 ‘We’ is Rob Krul and myself, the projects are: a steel Rouquayrol Denayrouze regulator, the ‘Pig Snout Mask’ from the same inventors, the brass regulator backpack as used by the German Imperial Navy and last but not least the Modele 1873 Denayrouze underwater lamp. Click HERE to go to the first of the new chapters. Saturday May 12 - 2012. Two new chapters on the website! 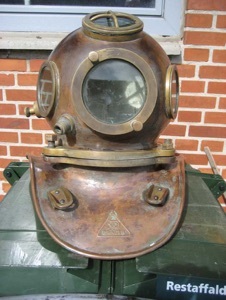 Today, at the front door of my house was offered to me a Siebe Gorman and Draeger-3-bolt diving helmet. The last time I have dived in 1987 with a Dräger helmet. That is why I cannot say of whether the helmets were real. The driver / salesman spoke perfect German. His white VAN had French number plates. He asked for 1900, - € per helmet. He asked several times for when I had that money available. 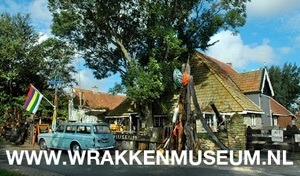 In his car he had several maritime items, such as a "historic war ship" in a glass case. We have agreed to speak together again on Monday at 08:00 clock by mobile and complete the "deal". Let's see what he does when I offering him 500, - € per helmet or less. He said farewell with the announcement that he still has customers are waiting of him in Rostock . Maybe I prevent another big disillusionment of a com-diver colleague. July 4 - 2012. 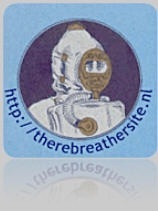 A NEW HISTORICAL DIVING WEBSITE WENT ON LINE! 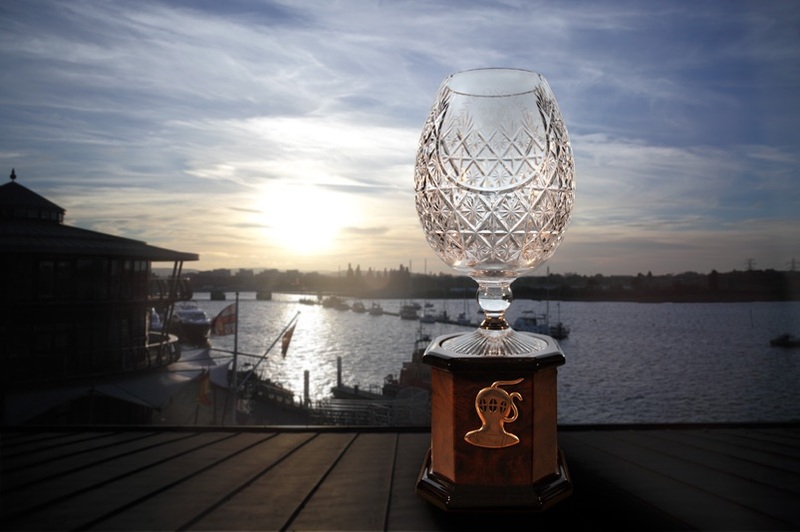 August 1 - 2012. 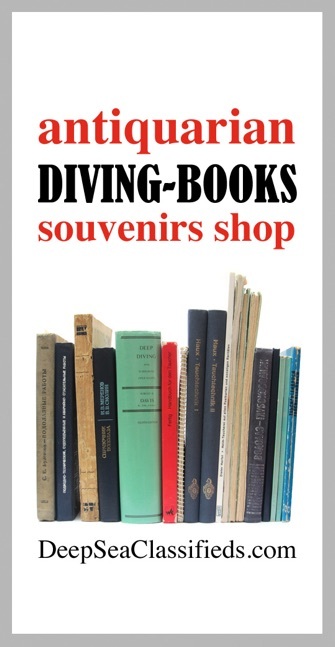 NEW HISTORICAL DIVING SOUVENIR SHOPS! 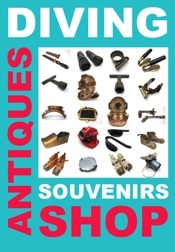 ‘Antiques’ , ‘Pro’ ( Diving ) , SCUBA and Rebreather, and last but not least: ‘Books’. 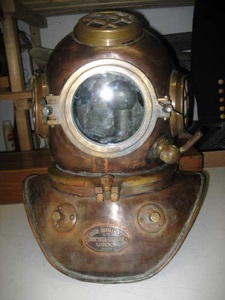 The ‘Frank Oschman Award’ 2013 of the Historical Diving Society in England has been given to the creator of the websites www.divinghelmet.com and www.divescrap.com. The award was handed over on November 23rd 2013 at the annual HDS Conference and Dinner at the RNLI in Poole. 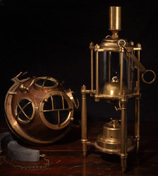 At the photograph here at the left a rare German light weight diving apparatus is shown as made by the ‘Hanseatische Apparatebau Gesellschaft’ in Kiel, Germany. 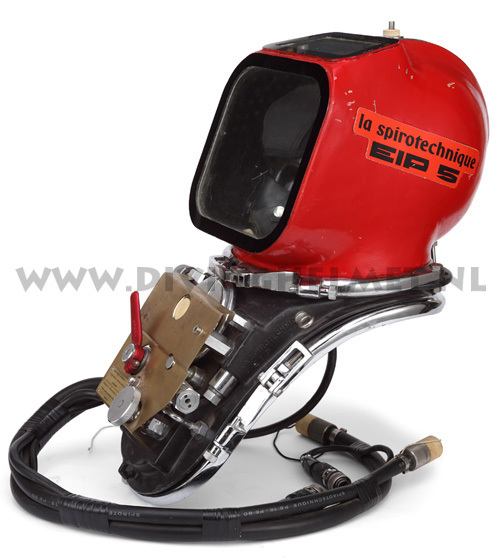 It is an equipment with a small size diving helmet. I bought such a helmet (for a lot of money) in early october 2013 in South America. I prepaid both the helmet and the shipping to the seller, and the deal was that the helmet would be shipped to me within 1 week. But the tracking numbers the seller provided appeared not to be genuine, a lot of ‘stories’ followed but no helmet was ever sent. On Nov. 26 it appeared that the seller had sold the helmet to at least 1 other buyer but still offered it for sale in his shop in Buenos Aires, asking an insane amount of money. I was lucky to have started up a claim procedure right in time with PayPal and 7 weeks after having paid for the helmet I got my money back. 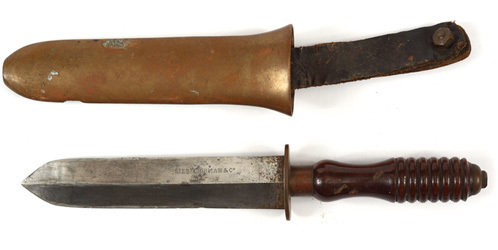 Today 2 new chapters have been published: the first chapter of a series of chapters on Siebe Gorman Divers Accessories showing several variations of the Siebe Gorman Divers Knife with a flat sheath. 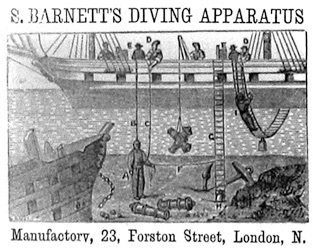 And a chapter on the London based Diving Apparatus manufacturer Samson Barnett. Click on the images here below to get to the new chapters. Many other chapters were updated and hundreds of new photographs were added. Special thanks to all of you who were sharing their photographs. And to those who sent photographs which have not been (yet) published: as soon as I have time I will continue uploading photographs. 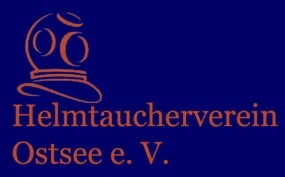 Also a since long awaited court case took place last September in Germany, where the theft of 38 Diving Helmets came to court (5 years after the theft) Since the people who were arrested after the theft were also responsible for the sales of important quantities of reproduction (fake) diving helmets, this matter is explained in the ’Fake Helmet’ chapter. Please click HERE to go the chapter. Above: the plaque from the Seabee Museum. 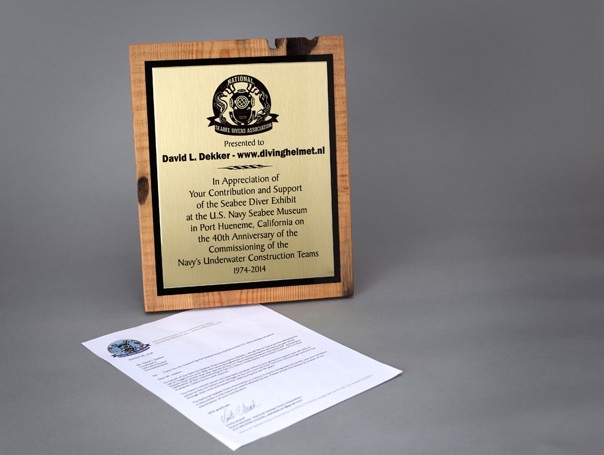 Both the plaque and the exhibit were sponsored/funded by the National Seabee Divers Association. December 16 2014. 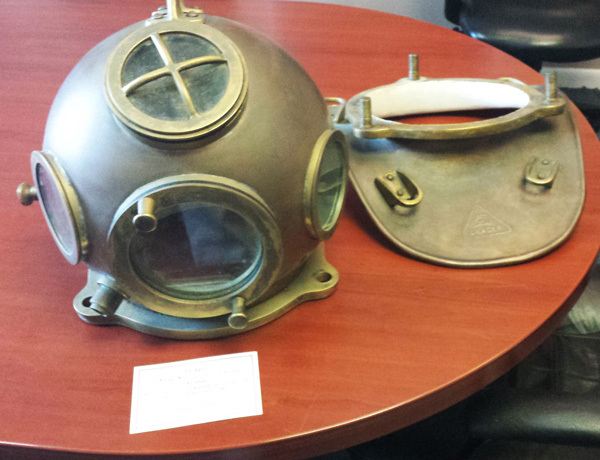 Cool stuff brought up by wreck divers! The last months I have bee driving around (a lot) through Europe to take photographs of diving helmets for my German Diving Helmet book project. 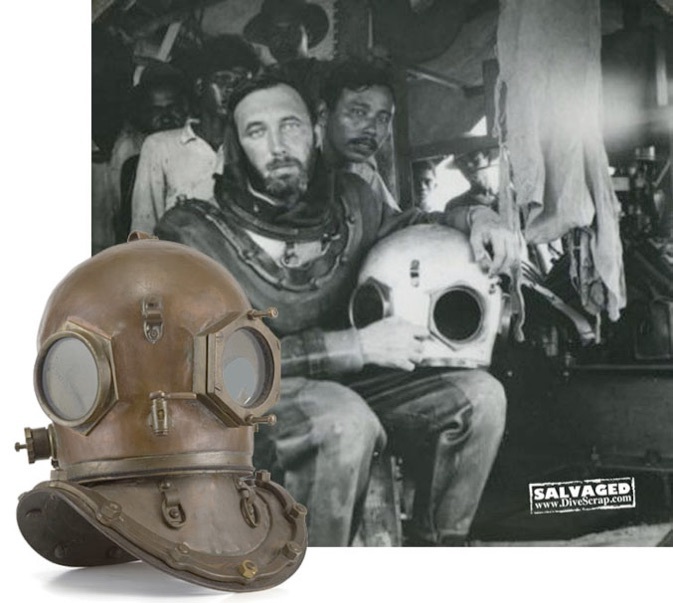 On my way back from Sweden I stopped by at some friends down the road to take a look at some ‘cool stuff’ they raised from a sunken diving ship from the second world war. Two and a half helmet were found in the wreck, plus lots of other parts, some packed in the original boxes. 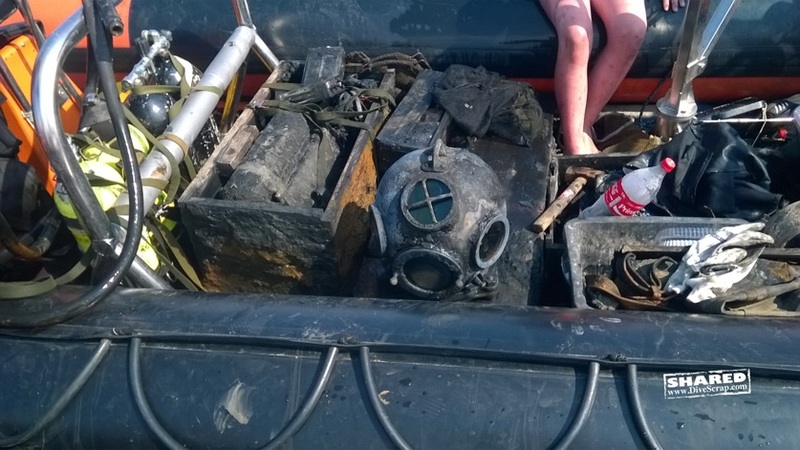 The divers count on recovering the third bonnet to complete the last helmet as well. I was kindly allowed to take home one of the helmets with me, so I could take photographs of it for the book. These pictures will be published in the book only, but for the website the divers shared a bunch of exciting photographs showing the actual salvaging of the equipments (and what happened with it since ...) I tried to convince them to leave the last dirty helmet ‘uncleaned’ and would have loved to take photographs of a complete dressed jake with all salvaged parts, but most of the stuff they have cleaned up already. Still I am very grateful for the photographs they share with the site. January 17 2015. 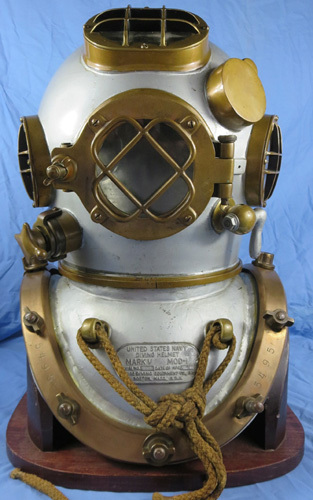 ‘Unknown Diving Helmet’ displayed at this website identified! Bonnet neck ring is number 5940 and the breastplate neck ring is 5501A. 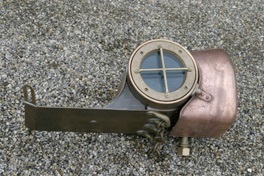 Morse manufacturer's plaque is lead and stamped serial # 551 date 11-44. If you have or want further information on this stollen helmet please contact Ken or Ron Brown in the CC box or at (415) 775 1165. Please forward this email to any colleagues who you think may be be able to assist. 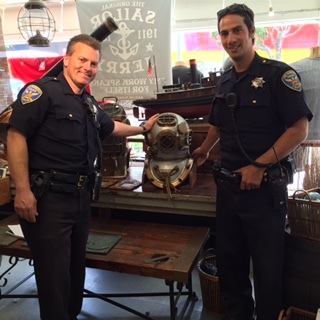 Today we received good news: The helmet which was stolen from the HDS members who own Frank's Fisherman's Supply on Fisherman's Wharf in San Francisco (read article here below) is back in the shop. The police found it in the trunk of a car in Daly City. June 14 2015. 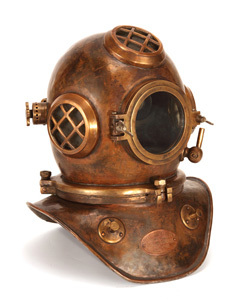 Can a fake diving helmet be used for diving? Yesterday I found 'The Journal of Diving History' #82 with the mail. An article which I wrote on an exceptional small sized Siebe, Gorman & Co helmet was published in it but unfortunately the most important illustration appears to have been left out of the article: the photographs showing the small helmet next to a standard 12 bolt Siebe, Gorman & Co. Ltd. helmet. 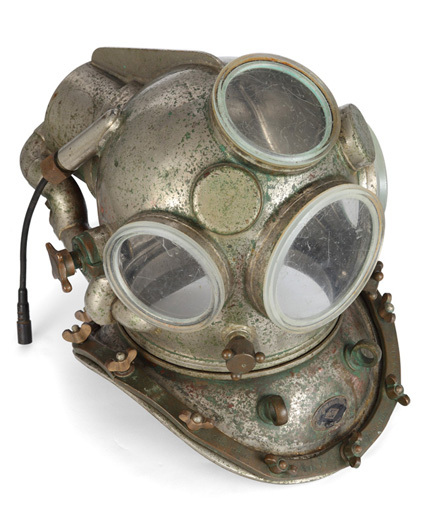 This is the only photo which shows how small this older helmet actually is so for the convenience of the readers of 'The Journal of Diving History' I decided to publish the missing photograph on facebook and on this website. December 31 2015 / January 1 2016. 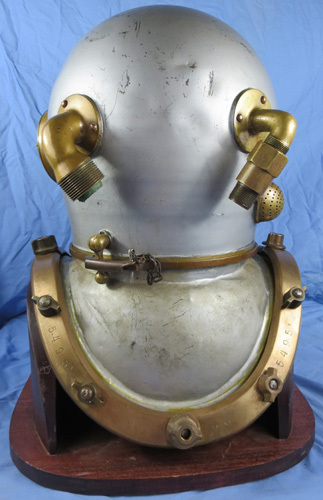 Do you have a German helmet, old photographs or other documents on German diving equipment and want to assist in the book project? Then pls. send me an email. Last year I travelled to several archives, museums and collectors all over Europe to make scans and take photo’s for my project, I will be continuing doing that in 2016 as well. February 20 to 28 2016. ‘Scaphandriers Mythes & Realités’ exhibition by Jean-Patrick Paszula and Enrico Porfirione in Theoule sur Mer, France. From Friday May 20 till Sunday May 22 2016 the ‘Northern Divers Meeting’ is organized in Turku, Finland. By surprise I learned that the iWeb software I obtained from Apple in 2011 is no longer supported by Apple. As a result my websites suffered from disappearing link buttons and through forums on the internet I learned that even when you replace these buttons with text links it is likely that after the next general software update from Apple the next problem(s) will occure so rebuilding the websites seems the only solution. 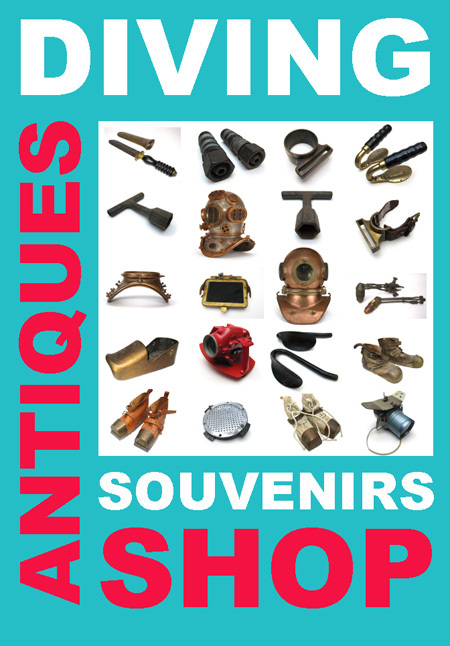 I just finished rebuilding the souvenirs shop, this website and the international index will have to wait until I find the time to do so: it is ‘months’ of work ... I am sorry for any inconvenience until the websites are rebuilt.